B.Ed Admission 2019 Many Universities conduct entrance exams for admission to B.Ed programs in India. This page has complete information about B.Ed Entrance Exam Dates 2019 - Online Application Forms. Bachelor of Education (B.Ed.) is a professional degree which prepares students for work as a teacher in schools. One has to study for five years to become a teacher, as the minimum eligibility to pursue BEd is a three-year undergraduate programme. To be a teacher in India, you need a Bachelor of Education (B.Ed.) degree. One has to study for five years to become a teacher, as the minimum eligibility to pursue BEd is a three-year undergraduate programme. A Bill was introduced in the Parliament (July 23, 2018) to introduce 4 years Integrated B.Ed courses. Union HRD minister Prakash Javadekar announced that four-year integrated B.Ed courses will be started from the next academic year. The four-year composite courses are B.A (B.Ed), B.Sc (B.Ed) and B.Com (B.Ed). Those who want to become teachers can apply for these courses after Class 12. Check out B.Ed Course Details which includes Admission, Eligibility for the Course, Duration, B.Ed Course Fee, Syllabus and more. ( B.Ed Admission in IGNOU ) Application Forms, B.Ed 2018 Last Date for Admission in various colleges .Also in this post include B.Ed. Colleges in Delhi, Mumbai, Bangalore, Gujarat, Bangalore, Kolkata. On this page you will find all infornation about B.Ed. Admission 2019. University of Lucknow M.PEd and B.PEd Admission 2019 Notification - University of Lucknow invites application for the admission to Master of Physical Education (M.P.Ed.) and Bachelor of Physical Education (B.P.Ed.) Courses academic year 2019-20. BRAOU B.Ed Entrance Test 2019 - Dr B.R Ambedkar Open University invites online applications for Admission into B.Ed. and B.Ed. (Special Education) Programs through Entrance Test for the academic year 2019-20. Army Welfare Education Society B.Ed Admission 2019 - Army Institute of Education will conduct test for admission to the B.Ed. Courses at Army Institute of Education (AIE), Greater Noida for the academic year 2019-21. Jammu and Kashmir JKBOPEE B.Ed Entrance Exam 2019 - Online Applications are invited from permanent residents of J and K State who are eligible and desirous of appearing in the Entrance Test for admission to B.Ed. Kashmir / B.Ed. (Special Education) in the Institute of Advanced Studies in Education (IASE), formerly Govt. College of Education, M.A. Road, Srinagar and Composite Regional Centre, Bemina, Srinagar respectively for academic session 2019. IGNOU Course overview and admission process for Bachelor of Education (B.Ed) programme for 2015 intake. Have a look at the course overview, admission process, fees, programme structure and more details for B.Ed. course from IGNOU. Programs offered by IGNOU School of Education - Education, Distance Education, Educational Technology, Adult Education. Indira Gandhi National Open University popularly known as IGNOU, School of Education undertakes academic activities pertaining to two major areas. Jharkhand B.Ed Combined Entrance Exam 2019 - Jharkhand Combined Entrance Competitive Examination Board (JCECEB) invites online Application for B.Ed. Entrance Exam 2019 for admission in Govt. Colleges of Jharkhand. RIE CEE 2019 Notification - Applications are invited from eligible candidates for Regional Institute of Education Common Entrance Exam (CEE) 2019 for the Admission to B.Sc. B.Ed./B.Sc. Ed/B.A. B.Ed. * /M.Sc. Ed and B.Ed. (Two Year) Programs offered by Regional Institutes of Education of NCERT at Ajmer, Bhopal, Bhubaneswar, Mysore and NERIE, Shillong for the academic session 2019. Dr Harisingh Gour Vishwavidyalaya, Sagar will conduct entrance tests, UGET/PGET & PHDET, in the May 2018 for admission to various UG/PG Courses and PhD Programs offered at the university for 2019 session. Andhra University B.Ed. Entrance Test 2019 Distance Education mode - Applications are invited from in-service teachers from Andhra Pradesh with D.Ed./any teacher training qualification for entrance examination for admission into 2-year B.Ed. Program (Distance Mode) for the academic year 2019. CUCET 2019 Notification has been released now. It is a combined entrance test organized for providing admission into various UG, PG & other courses offered by the central universities across the country. YVUCET 2019 Notification - Applications are invited for admission into various Post-Graduate Courses, 5-year Integrated M.Sc., Bachelor of Fine Arts and PG Diploma in Theatre Arts Courses in constituent and affiliated Colleges of Yogi Vemana University through Common Entrance Test (YVUCET-2019) for the academic year 2019. Check out on IPU CET 2019 Notification. Also look for more info on exam dates, eligibility and application for GGS Indraprastha University CET 2019 for Admission. Guru Gobind Singh Indraprastha University (GGSIPU) will conduct IPU CET 2019 in the month of April, May and June 2019. The Indraprastha University Common Entrance Test will be held for UG and PG admission in the University. SRMHCAT 2019 - SRM University Haryana Common Aptitude Test -SRM University Delhi-NCR, Sonepat invites applications for admission to UG and PG Programs through SRMHCAT 2019 Entrance Exam for the academic year of 2019.
International Centre for Distance Education & Open Learning (ICDEOL), Himachal Pradesh University, Shimla has invited applications for admission to B.Ed. and M.A. (Education) Program to distance education courses commencing in 2019. ANUPGCET 2019 Notification - Acharya Nagarjuna University, Guntur invites applications for the admissions into Postgraduate Courses offered on its Campus, PG Centre, Ongole and its Affiliated Colleges for the academic year 2019 through ANUPGCET 2019. Mangalore University (MU), Mangalagangothri has released notification for the eligible candidates for admissions to the Bachelor of Education (B.Ed.) Open Distance Learning Program (Two years) for the academic year 2019. Lucknow University M.Ed Admission Test 2019 Notification- University of Lucknow conducts the admission test for Admission to M.Ed. Program every year through Lucknow University M.Ed Admission Test 2019. TNTET 2019 - Teachers Recruitment Board (TRB), Applications are invited only through online mode for Teacher Eligibility Test, Paper I and Paper II for the year 2019 from the eligible candidates in Tamil Nadu. 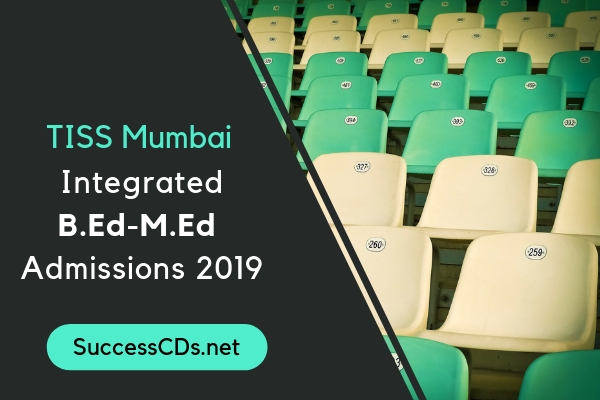 TISS Integrated B.Ed M.Ed Admission 2019 – Tata Institute of Social Sciences (TISS) Mumbai invites applications from the candidates for admission into integrated B.Ed M.Ed Program for the year 2019. Kumaun University B.Ed Entrance Examination 2019 - Kumaun University, Sleepy Hollow, Nainital invites applications for admission to Bachelor of Education (B.Ed) Entrance Examination and Admission for the academic year 2019. Bharathiar University B.Ed Distance Education Admission 2019 - Bharathiar University Coimbatore invites applications for admission to the B.Ed. Program 2019-21 through the School of Distance Education (SDE) approved by the Distance Education Bureau (DEB-UGC), New Delhi and National Council for Teacher Education (NCTE), Bangalore. IGNOU B.Ed Entrance Exam 2019 Result has been announced online. The candidates can now check their result for the BEd entrance exam held on December 16, 2019. B.Ed Course Structure Changed, will be of 4 years from next year. Check with us for more details on change in course structure for B.Ed program. SJSV B.Ed Admission 2019 - Shri Jagannath Sanskrit Vishvavidyalaya invites applications for admission into two years Shiksha Shastra-B.Ed. Course for the academic session 2019-21. Uttarakhand Sanskrit University B.Ed. Admission 2019 - Uttarakhand Sanskrit University, Haridwar has released notification for eligible for admission into B.Ed. Program for the academic year 2019-21. Cluster University B.Ed-M.Ed Admission 2019 – Cluster University, Srinagar invites online applications from eligible candidates for admission to 3-Year Integrated B.Ed –M.Ed Programme offered for the Academic Session 2019-20. ICFAI University B.Ed. Admission 2019 - ICFAI University, Dehradun has invited applications for admission to Bachelor of Education (B.Ed) program for the academic session 2019. B.Ed. Entrance Exam syllabus for 2019.Visit us for more information on B.Ed. Syllabus for Entrance Exams in 2019. JKBOPEE B.Ed Entrance Exam 2019 - Online Applications are invited from permanent residents of J&K State who are eligible and desirous of appearing in the Entrance Test for admission to B.Ed. Kashmir / B.Ed. (Special Education) in the Institute of Advanced Studies in Education (IASE), formerly Govt. College of Education, M.A. Road, Srinagar and Composite Regional Centre, Bemina, Srinagar respectively for academic session 2019. Kalasalingam University Engineering Entrance Exam 2019 - Kalasalingam University invites application for Kalasalingam University Entrance Exam 2019 for admission in various Undergraduate and Postgraduate Courses for the academic year 2019. Sastra University Directorate of Distance Education invites applications for admission to Distant B.Ed. (2 years) Program for the session 2019. BHU PET 2019 - The Banaras Hindu University will conduct Postgraduate Entrance Test (hereinafter called „PET‟), during 12th to 21st May, 2019 for admission to various Postgraduate Courses for the Session 2019-2020. TNOU B.Ed Distance Education Admission 2019 - Tamil Nadu Open University (TNOU) is conducting the Entrance Examination for admission to B.Ed. Program for January 2019 Batch. Interested candidates can check all the details of TNOU B.Ed. Admission 2019. UP B.Ed Entrance Exam 2019 – UP B.Ed Entrance Exam 2019 notification is expected to be released soon. The Government of Uttar Pradesh has authorized Mahatma Jyotiba Fule Ruhelkhand University, Bareilly to conduct UP B.Ed Joint Entrance Examination 2019 for admission to B.Ed. Courses in various Govt. /Aided/Self-Financed Colleges and Universities in the State of Uttar Pradesh. AP Ed CET 2019 - A,P. Education Common Entrance Test (AP Ed.CET-2019) will be conducted by Andhra University, Visakhapatnam, in accordance with G.O., M.S. No.72 (SE. Trg.-1) Dept. dt.05-07-2014 & Amendments for admission into B.Ed. Regular Course of two years. IGNOU B.Ed. Admission 2019 Registration coming to end soon. Candidates hurry up and apply for the same through IGNOU official website. BHU UET 2019 - The Banaras Hindu University shall conduct Undergraduate Entrance Test (hereinafter called „UET‟) during 12th May 2019 to 16th May 2019 [Refer to Section 22 containing the Test Schedule] for admission to various Undergraduate Courses for the Session 2019-2020. Jadavpur University B.Ed. Admission 2018 - Jadavpur University offer admission into two-year full time B.Ed. Course for the academic year 2018-19. Gauhati University BEd Entrance Test 2018 - Gauhati University has released notification of B.Ed. Entrance Test 2018 for admission to B.Ed. Course in the B.Ed. College affiliated to Gauhati University and recognized by the NCTE for the academic year 2018-19. University of Kashmir B.Ed Admission 2018-19 - Online application forms are invited from the desirous candidates for admission to two years B.Ed. Program, Session 2018-20 in Private B.Ed. Colleges affiliated with the University of Kashmir, Srinagar. SPMVV Tirupati Distance Education B.Ed Admission 2018 - Applications are invited through proper channel from women candidates for admission into Additional Methodology Program in B.Ed. Course 2018-19 through Directorate of Distance Education of Sri Padmavati Mahila Visvavidyalayam. Jammu University B.Ed Admission 2018 -University of Jammu has invited online applications for admission to 2-year B.Ed. Regular Course for the session 2018-20 in the Non-Government Colleges of Education affiliated to the University of Jammu. Rajdhani College Bhubaneswar B.Ed. Admissions 2018 - Rajdhani College, Bhubaneswar of Odisha invites applications for admission into two years B.Ed. Program for the session 2018-20 on Self-Financing mode. University of Kalyani B Ed. Admissions 2018 - Online applications are invited from eligible candidates for admission to the B.Ed. Program (Session 2018-19) at the Department of Education, University of Kalyani. HPU B.Ed Entrance Exam 2018 - Himachal Pradesh University, Shimla has invited applications from eligible candidates for the B.Ed. Entrance Test for admission to 2 years regular B.Ed. Course in Himachal Pradesh for the Session 2018-20. University of Calicut B.Ed Admissions 2018 - Online applications are invited for admissions to B.Ed. Course (Two years - 4 semesters) for the academic year 2018-20 in the Govt. Colleges/Aided Colleges/University Teacher Education Centres/Unaided Colleges affiliated to University of Calicut. Punjab University Joint B.Ed Admission (Punjab) 2018 - Joint B.Ed. Admissions 2018 for Colleges of Education (Government, Govt. Aided, Private Self-Financed Colleges) Affiliated to Panjab University, Chandigarh, Punjabi University, Patiala and Guru Nanak Dev University, Amritsar and situated only in State of Punjab will be done through Common Entrance Test. Bijoy Krishna Girls’ College B.Ed Admission 2018 - Online applications are invited from eligible Deputed and Fresher candidate (except male) through the College Website for admission into Two years B.Ed. Program 2018-20. The course is affiliated to the University of Calcutta. Visva Bharati Santiniketan BEd Admission 2018 - Applications in prescribed form are invited from eligible candidates for admission to the Bachelor of Education (B.Ed.) NCTE recognized Regular Full Time 2-years/four semester Program offered by the Dept. of Education, Vinaya-Bhavana, Visva-Bharati, Santiniketan for the academic year 2018-20. NIEPMD Chennai M Ed & B Ed Admission 2018 - National Institute for empowerment of Persons with Multiple Disabilities (NIEPMD), Chennai invites applications for the admission in M.Ed. Special Education (Autism Spectrum Disorder (ASD) and Multiple Disability (MD) and B.Ed. Special Education (Autism Spectrum Disorder (ASD),Deafblind (DB) and Multiple Disability (MD) for the session 2018-19. Mizoram University B.Ed Admission 2018 - Mizoram University (MU), Aizawl invites application for admission opens for Bachelor of Education (B.Ed.) Program for the Session 2018-19 . Dibrugarh University B.Ed. CET 2018 - A Common Entrance Test was conducted by Dibrugarh University to provisionally selected candidates for admission into the B.Ed. Program offered in different institutions and the Department of Education under Dibrugarh University for the academic year 2018-19 . Scottish Church College B.Ed. Admissions 2018 - Applications are invited by Scottish Church College (SCC), Kolkata for admission to two years Bachelor of Education (B.Ed.) Course for the session 2018-20. Avinashilingam Institute for Women B.Ed, B.P.E.d. & M.Ed. Courses 2018 -Avinashilingam Institute for Home Science and Higher Education for Women, a Deemed to be University, Coimbatore (Tamil Nadu) has invited applications from women, for admission to various Programs offered by it for 2018-19 . Gopal Chandra Memorial College of Education B.Ed. Admission 2018 - Gopal Chandra College of Education, New Barrackpore online application are invited from students for admission to 1st year B. Ed. course for the session 2018-20. Jagadguru Rambhadracharya Handicapped University Entrance Exam 2018 -Jagadguru Rambhadracharya Handicapped University, Chitrakoot, Uttar Pradesh invited application for admission to B.Ed. and M.Ed. Courses through Entrance Examination 2018. Fakir Chand College B.Ed. Admission 2018. Check out more info on dates, eligibility, application for Fakir Chand College B.Ed. Admission 2018. Siliguri B.Ed. College B. Ed Admissions 2018 - Online applications in prescribed format are invited for admission to 2 years B.Ed. Course in College for the session 2018-19. Ramakrishna Mission Brahmananda College of Education B.Ed. 2018 -All the applicants applying to Ramakrishna Mission Brahmananda College of Education, West Bengal for the admission in B.Ed. Course [2 Years] for the academic year 2018. Tamralipta Mahavidyalaya B.Ed. Admission 2018 - Tamralipta Mahavidyalaya, Purba Medinipur online applications are invited from Indian Citizen in prescribed form for admission to B.Ed. Course for the session 2018-20. Prarambh School for Education BA B.Ed and BSc B.Ed Program 2018. Check out more info on dates, eligibility, and application for Integrated Bachelor Education Program 2018 . Allahabad University M.Ed. Entrance Exam 2018 - University of Allahabad, Department of Education has released notification for eligible candidates for admission into M.Ed. Programs for the academic year 2018-19 through an Entrance Test held by Allahabad University. Patna Women’s College B.Ed. Entrance Exam 2018– Applications are invited for admission to the Bachelor of Education (B.Ed.) Program (under Self Financing Scheme) of two academic years (2018-20) being run at the Department of Education, Patna Women’s College. Manav Rachna University B.Ed Admission 2018 - Manav Rachna University announces the commencement of Admission to its Bachelor of Education (B.Ed.) Program for the Session 2018-20. Candidates seeking admission to this program at Manav Rachna University should apply latest by 31st May 2018. Gauhati University M.Ed Admission 2018 - Gauhati University invited from eligible candidates for admission into two-year M.Ed. Course for the session 2018-19 in the Dept. of Education, GU. Aliah University B.Ed. Admission 2018 Notification - Aliah University will release notification for admission to the B.Ed. Programme for the academic session 2018 at the Department of Education, Aliah University in the following disciplines, as 1st method subject . UPRTOU B.Ed Entrance Test 2018 - Applications will be invited by Uttar Pradesh Rajarshi Tandon Open University from eligible candidates for admission into B.Ed. Course for academic session 2018-19 . VMOU B.Ed. Entrance Test 2018 Notification - Vardhman Mahaveer Open University (VMOU) has released notification for admission in B.Ed. Course through an Entrance Test for the academic year 2018-20 . AKU B.Ed. 2018 Joint Entrance Test: Applications are invited by Aryabhatta Knowledge University from eligible candidates for admission in B.Ed. Course for the session 2018-20 in Affiliated Colleges of AKU, Patna. Himachal Pradesh University, Shimla has invited applications from eligible candidates for the B.Ed. Entrance Test for admission to 2 years regular B.Ed. Course in Himachal Pradesh for the Session 2018-20 . Tamil Nadu Open University is conducting the Entrance Examination for admission to Bachelor of Education - Special Education (B.Ed. Spl. Ed.) Programme for the January 2018 Batch. Chaudhary Devi Lal University (CDLU) Sirsa invites applications for admission to two years Masters of Education (M.Ed.) Program in affiliated colleges for the session 2018-19. Directorate of Teacher Education & SCERT Odisha (SCERT Odisha), Bhubaneswar invites applications for admissions to M.Ed. Course for the academic year 2018-20 . The University of Allahabad shall hold an Entrance Test to admission for candidates seeking admission to B.Ed. Program for the academic year 2018-19. Tamil Nadu Teachers Education University (TNTEU), Chennai has published notification for eligible candidates for admission into two-year Master of Education (M.Ed.) Degree Program for the academic year 2018-19. Kannur University has released notification from eligible candidates for admission to two year B.Ed. Courses in the Department of Teacher Education at Kannur, Kasargod and Mananthavady and Govt. Aided and Unaided Colleges under Kannur University for 2018 session.